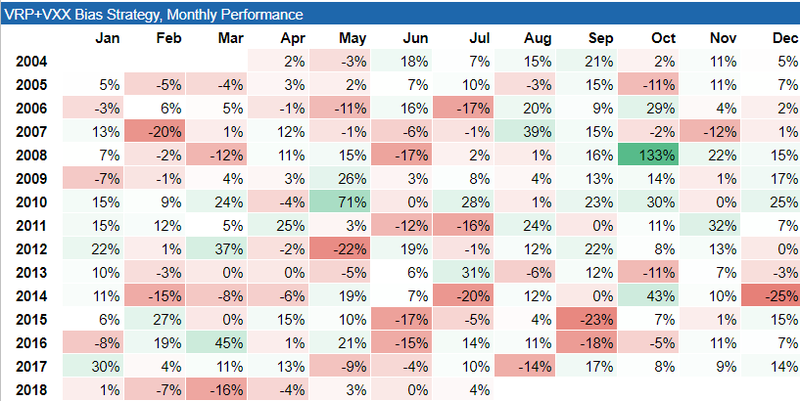 After a strong 2016 (+96%) and 2017 (+126%), our performance in 2018 has been rather lackluster so far. 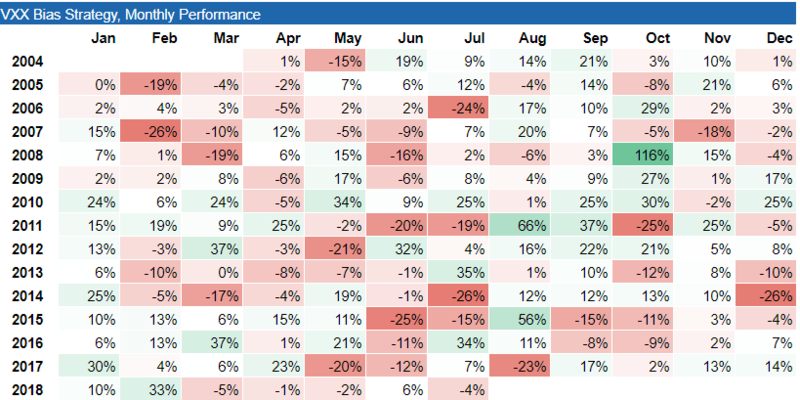 The biggest difference between this year and previous years is that the short volatility trade isn't working well. 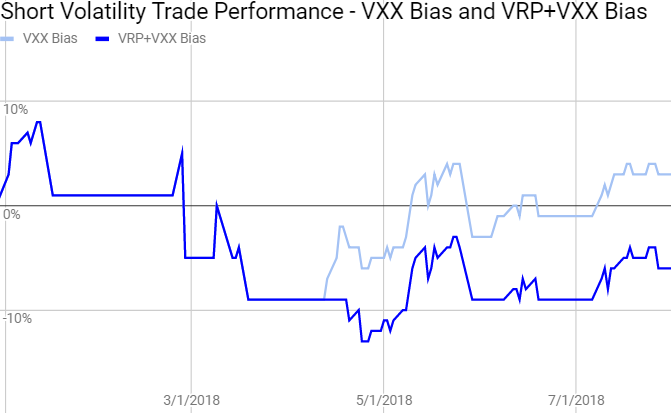 We've generally seen small roll yields, choppy market conditions with strong whipsaw reversals, and a VIX that closed the first day of the year with a record low close of 9.77 (47% below the median close on the first day of the year). 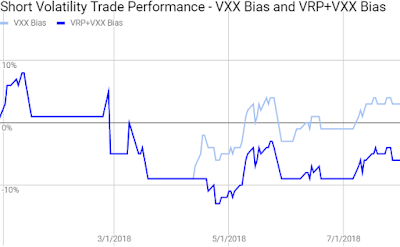 As you can see in the graph below, the short volatility trade (via buying SVXY) has generally contributed between plus and minus 10% to performance of both indicators all year. 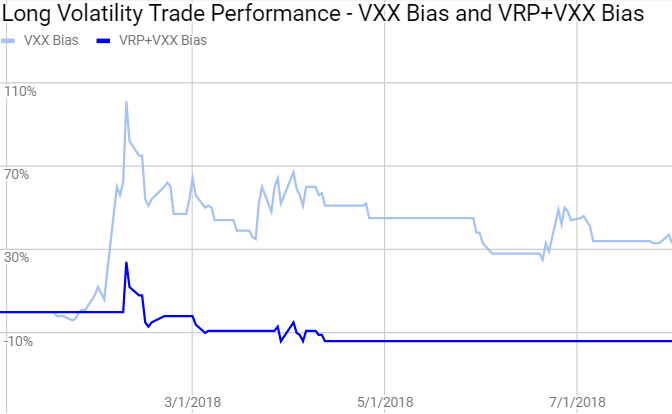 The long volatility trades (via buying VXX) helped the performance for the VXX Bias with YTD returns briefly exceeding 100% after February's historical VIX spike. 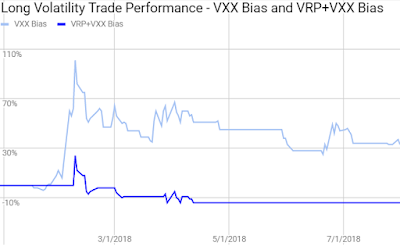 Despite the initial success however, both VRP+VXX Bias and VXX Bias indicators gave back most of their long volatility gains after February, as shown in the graph below. Overall, I've been very happy with how the indicators have performed since they were launched on our website back in 2013, but this year has certainly been slow so far -- especially over the last four months. 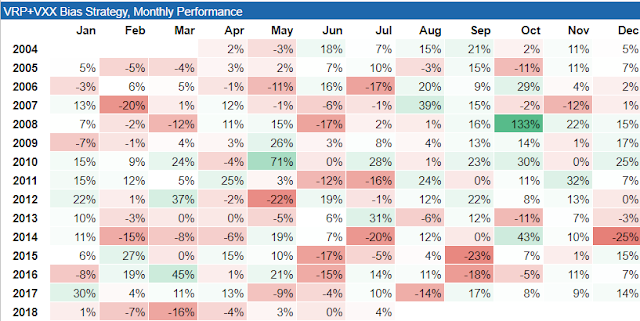 As usual, I've updated the values for monthly returns and they have been updated on our Strategy page, as well as below. Note: Trading Volatility+ subscribers have access to our VRP and VXX Bias indicators, our intraday indicator data, receive emails with preliminary and final change alerts for each of the indicators as well as our daily summaries, and interact with our private community of volatility traders in the forum. If interested, you can learn more about our services on our Subscribe page. The results are based on simulated or hypothetical performance results that have certain inherent limitations. Unlike the results shown in an actual performance record, these results do not represent actual trading. Also, because these trades have not actually been executed, these results may have under- or over-compensated for the impact, if any, of certain market factors, such as lack of liquidity. 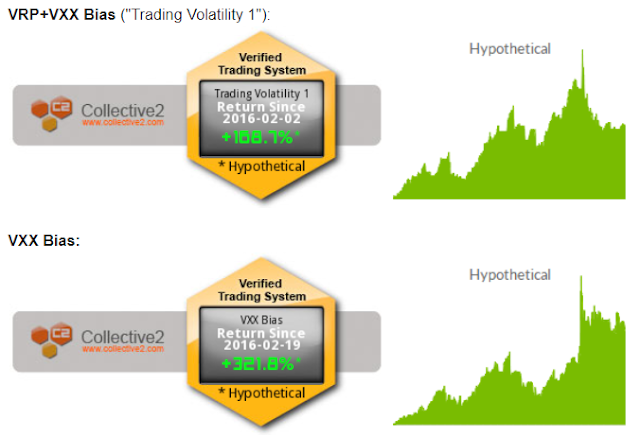 Simulated or hypothetical trading programs in general are also subject to the fact that they are designed with the benefit of hindsight. No representation is being made that any account will or is likely to achieve profits or losses similar to these being shown. Hypothetical and backtest results do not account for any costs associated with trade commissions or subscription costs. 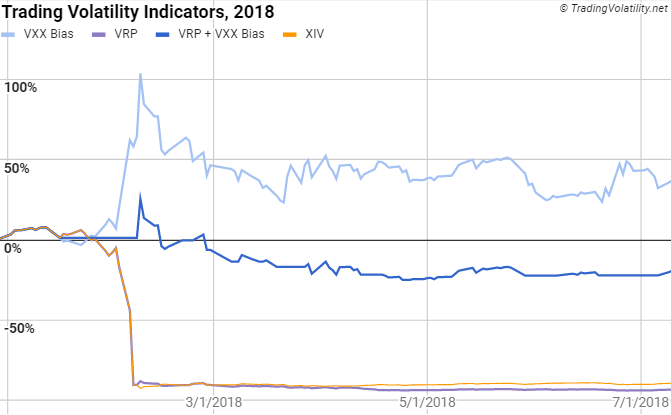 Additional performance differences in backtests arise from the methodology of using the 4:00pm ET closing values for SVXY, VXX, and ZIV as approximated trade prices for indicators that require VIX and VIX futures to settle at 4:15pm ET.